While we all wanted three points at White Hart Lane today, I think many United fans would have secretly settled for a draw. With City's tough run in there are plenty of opportunities for the reds to close the gap on Roberto Mancini's side; a draw at Spurs would have kept Fergie's men in touch. The fact that United won the game in North London is a fantastic bonus. A few days ago we posted an article which tried to predict the results of United and City's remaining games. After today's 3-1 win United are ahead of the prediction curve. We had cautiously anticipated a a draw at White Hart Lane and had speculated that United should play Phil Jones in midfield to provide extra defensive cover for the back four in the face of Gareth Bale's and Luca Modric's threat. We are happy to admit that on both counts we were wrong. 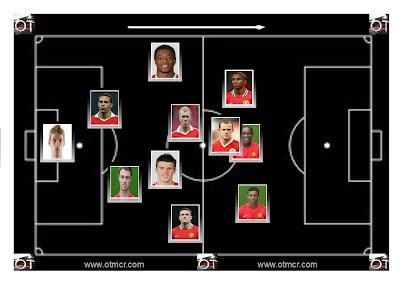 But on sevaral other points we were right; particularly on Michael Carrick. Although Spurs dominated much of the play, Michael Carrick was again top of the passing charts (see graphic, left). It is incredible how often this happens. In virtually every game since November, the quiet man of the United squad had gone about his business and linked up United's play wonderfully. Should he continue on this form, United have to be favourites for the title. In fact, had he not been suspended for the game in Basle, we would probably be preparing for a Champions League last 16 second leg at the moment. It is quite simply, a joy to watch United's number 16 at the moment; and he is clearly enjoying himself too. The back four is pretty much as we expected in terms of shape (although we thought Rafael would play right back; and Jones in midfield). Rio has been playing the deep lying, left of centre role all season so it was no surprise to see him sit back again. 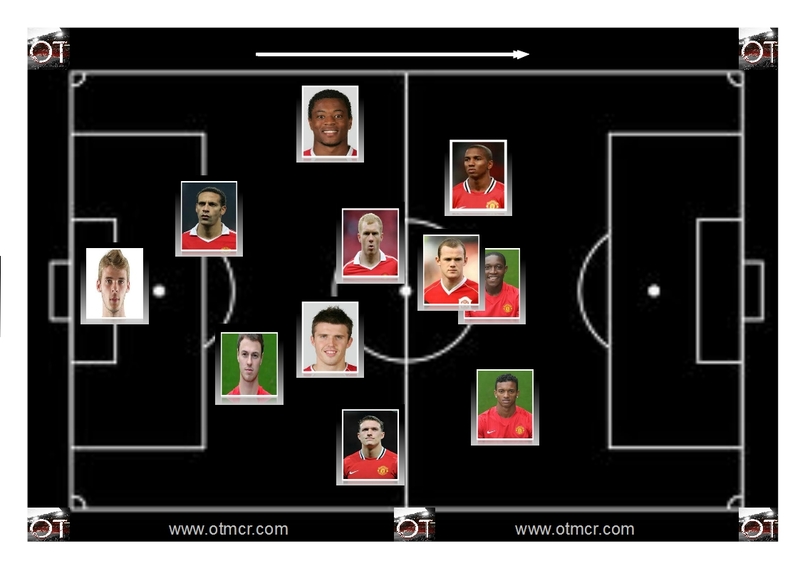 On the left, Evra played slightly deeper too, to counter the pace of Lennon. Again, we have seen this before in games against Spurs. 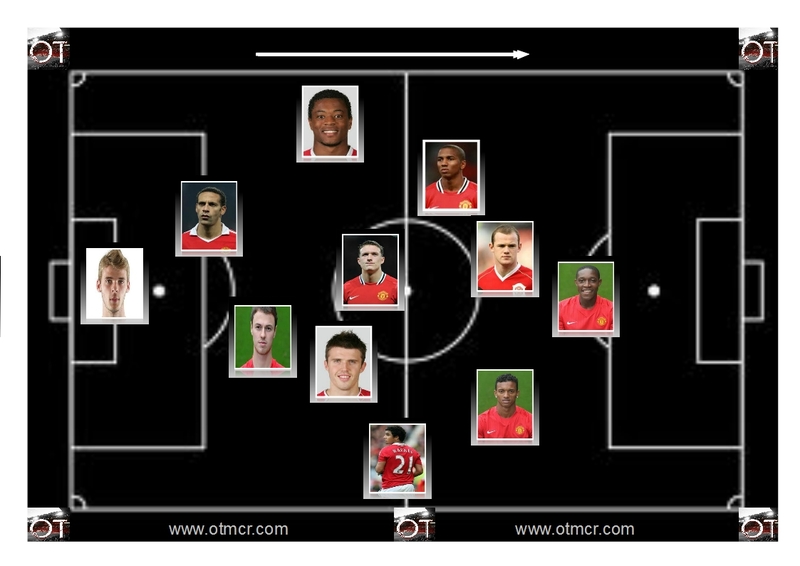 The central midfield shaped up pretty much as anticipated too; although Scholes played instead of Jones, and out wide, Nani and Young also adopted the positions that we expected. In fact every player played as we expected in a positional sense except for Welbeck who came much deeper than he thought he would as a result of Spurs shading the possession. In fact Spurs managed 52% of the ball and had 18 attempts to United's 6 but as we suggested yesterday, you don't need to dominate the ball to get at Harry Redknapp's side. That United were able to repel Spurs' attacks was down to some decent defending but also some super goalkeeping. David De Gea, the often maligned 'keeper, was vital for United today. Incredible saves have become the norm in recent weeks from the Spaniard. We have almost come to expect a logic defying stop or two from the youngster in every game he plays and he didn't disappoint us today, making a super stop just after half time. It was always going to be a settling in season for the young man from Spain this year and most reds are willing to give the boy time. If he keeps on producing phenomenal saves, as he did again today, he will win more and more over to his cause. It is no exaggeration to say that some of the saves he has made over the past few weeks could not have been made by any other goalkeeper in the premier league. He is a match winning 'keeper: it is as simple as that. Elsewhere today, Ashley Young was the obvious stand-out candidate with his two excellently taken goals. After setting up the winner for Ryan Giggs last week it was no surprise that the former Villa man was high in confidence today. producing two sublime second half finishes to take the game beyond Spurs. Should he continue this form, we think it will be United's title.